The Shropshire Hills area is designated as an Area of Outstanding Natural Beauty (AONB), in the English county of Shropshire, close to its border with Wales. 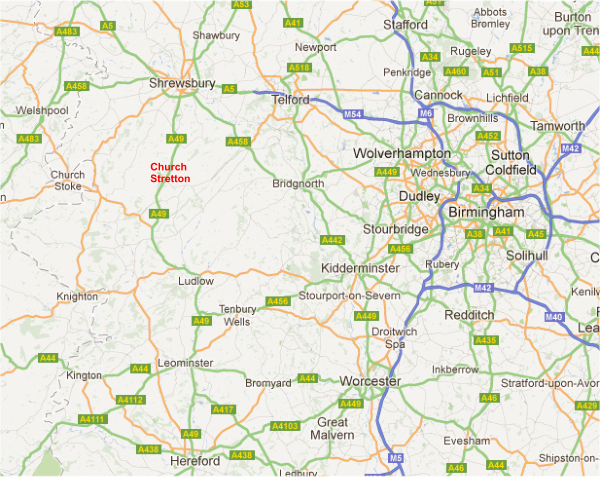 The area encompasses 802 square kilometres (310 sq mi) of land primarily in south-west Shropshire. The A49 road and Welsh Marches Railway Line bisects the area north-south, passing through or near Shrewsbury, Church Stretton, Craven Arms and Ludlow. Within the Shropshire Hills, is the Long Mynd, located near Church Stretton, which covers an area of 5,436 acres (8½ square miles). It peaks at Pole Bank at a height of 516 metres (1,693 feet). This area provides some of the best and most scenic riding routes in the UK. The hills cover a great many different types of terrain including roads, bridleways, fields, moors, forest drives and batches.